From the team that brought you Fairly Dangerous last year comes another dark comedy created for Nanoreno 2016 - "Palette Swap"! "Would you trade your entire existence to play God in an artificial world? For almost my entire life, I thought that, given the opportunity, I wouldn't hesitate. But now...hell, what I wouldn't give to be home." 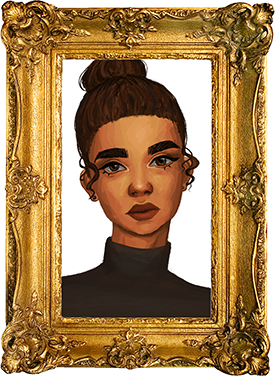 Zaria, an aspiring art student, discovers a mysterious painting in her school's art gallery. She gets sucked into the painting – which isn't all that bad, except her physical body is still in the real world, and whatever was previously in the painting is now in control of it. 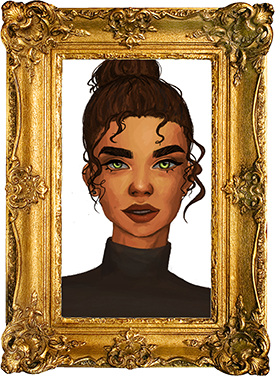 Zaria has a difficult decision: to either find some way to return home...or embrace this chance to start over, to succumb to the alluring charm of Elodia and see what she could make of it. A no-nonsense girl who ends up being sucked into a painting. What can you do? The thing now walking around in our heroine's body. Safe to assume they're bad news. 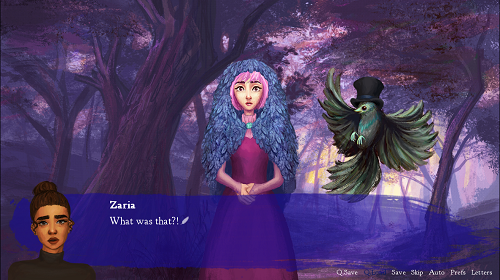 I mean, look at what they did to Zaria's hair. And the rest are secret, even more secret than the ??? character above. Play the game to find the rest of 'em! Expect a lot of "what?!" moments in the game. What was your favorite scene or joke? Which one did you like the least? Did you run into any bugs? Did you get the story? Was it too confusing? Are you okay after reading the story, like actually are you physically okay? If you need to talk, you can always private message one of us. Do Toodle-toots have hands or feet? Did you run into a section where our writer melted down? If so, what did you think of it? Thank you for stopping by this thread and (hopefully) downloading our game. Special thanks to my teammates. Without them, this project wouldn't have happened. Good job, team! We ask that you share this visual novel with your mother and your dog and your best friend's girl. Share this with all your friends and even your enemies. Just share it in general. Let's work together to let as many people as possible know that Palette Swap exists. Warning: some Toodle-toots may have been harmed in the making of this visual novel, but the harm was within the realms of their contracts. They signed those contracts willingly, and were in no way coerced. They were compensated accordingly. Visit kaleidofishstudios.com to learn more about what I'm working on. It was really fun to work with everyone on this! I've been eyeing this game for a long time now, but never got to download it because of my terrible net at home (Well, I could've downloaded this through my school's wifi, but my bandwidth usage is getting in the danger zone, so...). Today though, the heavens granted me mercy and I was finally able to play this! 1. What was your favorite scene or joke? Which one did you like the least? I was honestly laughing a lot through the whole game with all the absurdity of the scenes, but the one that really stuck with me was the part where Zaria ate Waldron. I don't know why. It's so morbid and amusing how Zaria acted so nonchalant about it. 2. Did you run into any bugs? Nope! I don't think I did. 3. Did you get the story? Was it too confusing? ...I... I DON'T KNOW. I mean, I think I got it. The whole game's really faithful with the whole "surreal" genre, after all. I'm not sure if my interpretation is correct, so I will just type it down here and please... PLEASE confirm it for me. 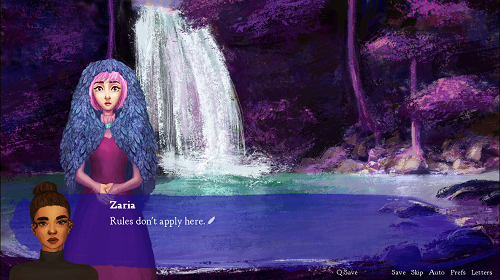 Sooo, Mariko and Charia are a part of a society wherein everyone has the ability to imbue magic in their paintings. Mariko, however, is really special and is able to give life to art really easily. She really loves Charia and swore to only use that power for her, which angered the elders of their society. Soon enough, they sought to kill Charia and Mariko, but they were able to escape by going into a blank canvas. The both of them decide to paint a world of their own dreams. That's how Elodia was born. As time passed, Mariko decided to go back to the real world by swapping bodies with someone--specifically Pilar. She swore to return, but Charia was very worried that Mariko might not be able to return because Pilar does not have any magic in her. I guess Charia was right? Mariko wasn't able to return, and Charia decided to swap bodies with Zaria to go find Mariko. Soooo, this means, Pilar isn't a painting right? And um, I'm assuming the letter with two parts (I think it was Letter #22?) was written by Pilar, and that's why she got really angry at the mention of Mariko's name? Am... Am I right?? Anyway, I am very confused, really. But I think the story makes sense to me, assuming my above theory is correct. 4. Are you okay after reading the story, like actually are you physically okay? If you need to talk, you can always private message one of us. I... I think I am. I got a bit of a headache but I'm still breathing. Now, for the spoiler questions! 6. Do Toodle-toots have hands or feet? Waldron mentioned something about holding the brush (or was it a knife?) with his hand instead of his wing, and Pilar said they can dance. So I have to answer yes. 7. Did you run into a section where our writer melted down? If so, what did you think of it? YES. Oh my god, I was laughing so hard at that one! At first, I was like, "What? Is this... is this on purpose...? To further push the surreal vibe?" but then I realized it was the real writer speaking, obviously about to go mad at the absurdity of the whole game. I have to say, it was fun to read and not out-of-place at all, given how surreal this VN is supposed to be. I loved that part. I really, really liked this VN! I absolutely loved the absurdity of the game, the crazy, off-beat jokes, and the numerous art-related tidbits. The writing and chosen BGMs are awesome too, and the art. Oh my goodness, I LOVED the art. 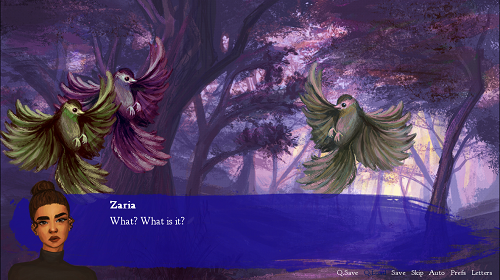 The backgrounds are amazing, and the sprites are beautiful. I can tell the whole team put a lot of effort into this game. Thank you for the wonderful VN! I'd love to see more from you guys. Hey, Kaen here. I'm the CD/Editor/24-7 Skype Quips Guy. Glad you enjoyed our game! Thanks for the thoughtful response, and I think I can speak for the team when I say we're honored that you used the limited availability of your internet to download our project. So first of all, I'm a firm believer in reader-response criticism, a theory that views the reader's interpretation of the story as being more important than the writer's intention and therefore vital to the completion of a story. I am hesitant to affect the perspective of the reader in any way through giving insight outside of what is already written. That is because I think the interpretation of every reader is inherently correct. That being said, you did ask, and the surrealistic nature of the story is pretty confusing at times, which is sort of why we included that question in the first place. So, y'know, all pretentiousness aside, Dusky suggested that I post the basic backstory just for confirmation. To clarify, this is what I had in mind when creating the concept for the story, so it might be different from what the other group members thought. The backstory was heavily inspired by Dorian Gray, brought to my attention by BobotheParrot, hence the special thanks. Mariko and Chiara come from a race of artists that have the power to create Dorian Gray-esque paintings. For those that don't know Dorian Gray, these paintings allow the subject/owner to be immortal and invulnerable by bearing all of the effects of time and external forces. This is done through the entrapment of another person into the painting to endure all the consequences. The human sacrifice is also rendered immortal, and is forced to suffer in the stead of the subject/owner until the painting is destroyed. This ability is coveted and sought after by rulers and powerful figures, and their race prospered because of this. However, morality kicked in, so the elders of their race started experimenting to create artificial life in these paintings so they could mass produce these paintings without the need of human sacrifices. Mariko was the first of their kind to be able to do this, but she kept it a secret. However, the elders found out and tried to exploit her powers. She refused to, as stated in the writing, desiring to keep it exclusive for Chiara. At the same time, as they stopped the production of these paintings, a powerful nation got restless and decided to seize their city to create a monopoly of these paintings. Mariko escaped with Chiara through her first creation, a blank portrait. Everyone else was either killed or imprisoned, forced to create paintings and then serve as sacrifices in these paintings (see Letter #09). The canvas that Mariko and Chiara are hiding in was looted along with the city. In order to build their own world, Chiara and Mariko began painting it, creating anchors in order to secure its existence. However, this came at a price: the more solidified the world is, the less inhibitants would remember of the real world. Over time, the canvas bloomed into a stunning painting, reflecting what Chiara and Mariko painted in the world. People noticed, and were afraid of it being cursed, plotting to destroy it. Mariko noticed, and decided to leave the painting in order to protect it. Pilar passed by one day, and Mariko took the opportunity, pulling her in as a replacement for herself. Chiara was left behind, alone, and decided to wait for Mariko. Mariko never came back, with the fading areas hinting at her demise (see Letter #13). After, ehm, a few hundred years, the painting wound up at a modern art gallery, and that's the start of the story. In comes Zaria, and I don't think I have to explain the rest. Feel free to ask additional questions, if my explanation is missing some parts. Eh, the letter was a bit wonky. It was meant to be Chiara writing, but she forgot about her own identity. Well, she forgot everything apart from Mariko. However, at the ending, Chiara had self-identity, so I tried to rework it, but the reworked letter came too late to be incorporated with the first release, so it should be fixed the next release. 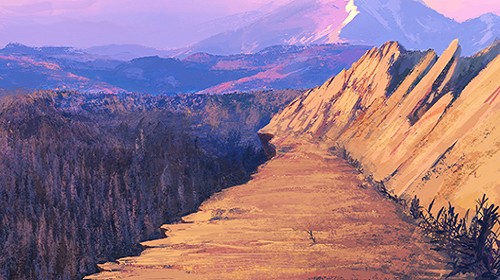 Q5&6 will be answered in the next release, when we get around to it. Look forward to it! You left the type of comment that I only dream of getting. When you make something that's so off the mainstream that it's a tributary of a tributary, it can be hard to get comments, let alone one like the one you wrote. Comments like yours make all the difference in the world. I'm glad that the game was able to make you laugh. Kaen fielded the response to your Q3 answer. My thoughts line up similarly to the reader-response criticism theory he mentioned. So what you think about the story still fits! the Waldron/apple scene. That game's particularly morbid. I'm also glad that the writer freak out part worked for you. I was on the fence about including it, haha. Good thing I kept it in there. And about the Toodle-toots... That's for you to decide. Again, another thank you to the rest of my team for bringing this project to life. Everything came together into something really lovely. Thanks again, all, and thank you to everyone who's downloaded this game so far! consider giving us a walkthrough? Yup.. I think? .. I hope.. OK. I ADMIT THERE ARE A LOT OF THINGS THAT I HOPE WILL GET CLEARED UP WHEN I FIND LETTER #16 AND FINISH THE ENTIRE FREAKING GAME CUZ THERE ARE MANY CHOICES. t_t yes. it was. but things get clearer as we re-replay it X'D. jk i love this game. The insane amount of times that I just stared at my screen in confusion and disbelief is astounding. I enjoyed myself, though. If anything, the game took my mind off of everything else, and it even got a little bit philosophical at times, almost? A+ from me. Is there any sort of guide/walkthrough, though? I thiiiink I got all of the endings but I don't have all of the letters. As for a walkthrough, I'll have to get back to you on that. There are a total of eight endings and twenty three letters. Letters are not tied to endings; instead, they are bonus collectibles that you may find in the backgrounds. If you're interested, I could dig through the old files and see if I can put together a chart for the location of each letter. Let me know if that's something you would like to have. Hey KaenSe4, thanks for the suggestion! I have seen Fairly Dangerous and it's definitely something I'm interested in playing. I would love some sort of chart to use as long as it isn't too much of a bother for you! It will take a while. I'll update the thread when I complete it. Attached is the full walkthrough of Palette Swap, including all letter locations and plot branches. Keep in mind that the letters are scattered throughout the background, lighting up only when your cursor hovers over them. Click them to pick them up, and they can be viewed again in the letter gallery, which is located next to the Prefs button on the bottom right. Keep in mind that you have to enable draw.io diagrams in Google Drive to view this flowchart.